My sister Adrienne was born on October 31. For the first five years of her life she was outraged by the extreme injustice that she didn't get to participate in most of the fun celebrations of Her Birthday: the trick-or-treating, especially. 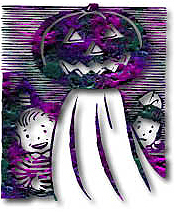 Most children know nothing of Samhain, All Saints' Day, or any other traditions behind Halloween. What they know is that it's time for candy and ghost stories, Haunted Houses and dunking for apples at parties.